Spray a large pan with oil and fry the soffritto mix for 5 minutes until softened. Add the pork and cumin seeds, and cook for 5 minutes. Stir in the beans and chipotle paste. Cover and simmer gently for 15 minutes until the pork is cooked through. 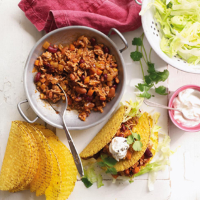 Fill the taco shells with shredded lettuce, then spoon in the pork and bean mixture. Top with a little yogurt and a few coriander leaves, and serve immediately. Cook’s tip: Adding a spoonful or two of chipotle paste is a great way to add a rich, smoky flavour to chilli and other Mexican-style dishes.